It's been pointed out to me that I haven't blogged for a while. Looking at the date of my last post, I have to admit that this is true. It's not that nothing has been happening, just that most of it is business-as-usual and probably not very enthralling. Five years ago today we were on our first visit to Prince Edward County, hoping to find somewhere to live. It was a cold, blustery day; sometimes raining and sometimes snowing. 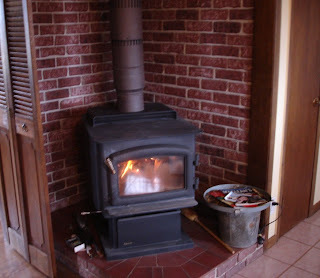 One of the first things we saw as we stepped into the house was the woodburning stove; warm and welcoming. The kitchen has changed completely since then. All except for the woodstove which continues to be the heart of the house (but without the faux-brick surround it had then). Out in the barnyard, an almost blank canvas awaited us. We didn't venture into it on the first visit (much too cold and wet), but on our second viewing, three days later, the weather had cheered up and we explored the barns and woodland behind the house. Now that same space is covered by the greenhouse we put up in 2008. I spent some time on Saturday tidying it up and hoeing weeds out of the cracks in the concrete. This is how that space is looking today. Maybe it doesn't look terribly tidy to you. But you haven't seen the 'before' picture (which I conveniently neglected to take). The raised beds are looking good and already producing some food. 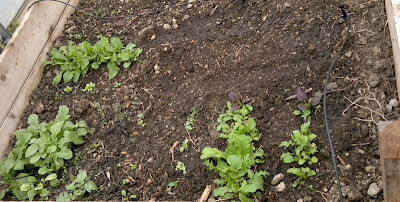 On the left of this photo is the purple sprouting broccoli which I left growing over the winter. I've tried this most years and this is the first time that it hasn't been killed by frost. We had some with our lunch last weekend and there are new sprouts coming. The rest of this bed is filled with young peas, growing up tomato cages. They don't seem to mind that the supports were designed for another plant. 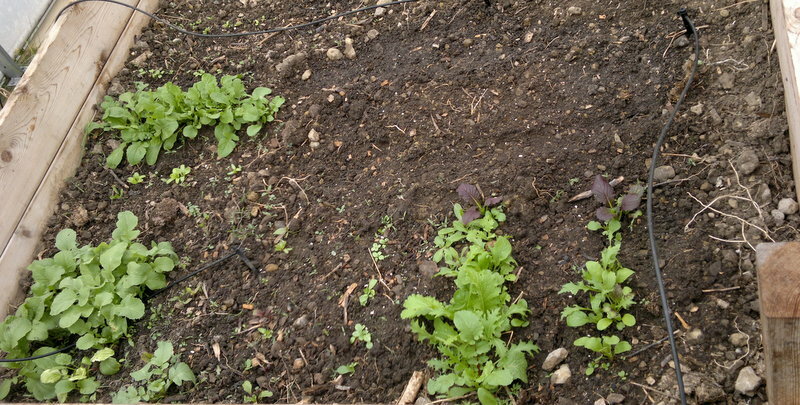 In the bed which held tomato plants last year I've got radishes, beets and salad greens of various types growing. I'm trying to get better at timing my succession sowing of salad leaves: too often I end up with a glut followed by a few weeks of no-greens-at-all. Not this year. Oh no. This year I'm going to get it right. Today I sowed another few rows of greens in one of the barnyard beds, along with some parsnips, carrots and some more beets. It's a lot drier outside than it usually is at this time of year: five years on, we could really do with some of 2007's rain. But maybe not the snow, if everyone's OK with that. Veg Plotting has a 52 week salad challenge going. I'm not growing, but I'm armchair growing. Volunteer nasturtiums are coming up.